The blog has been a bit quiet lately, for several reasons. 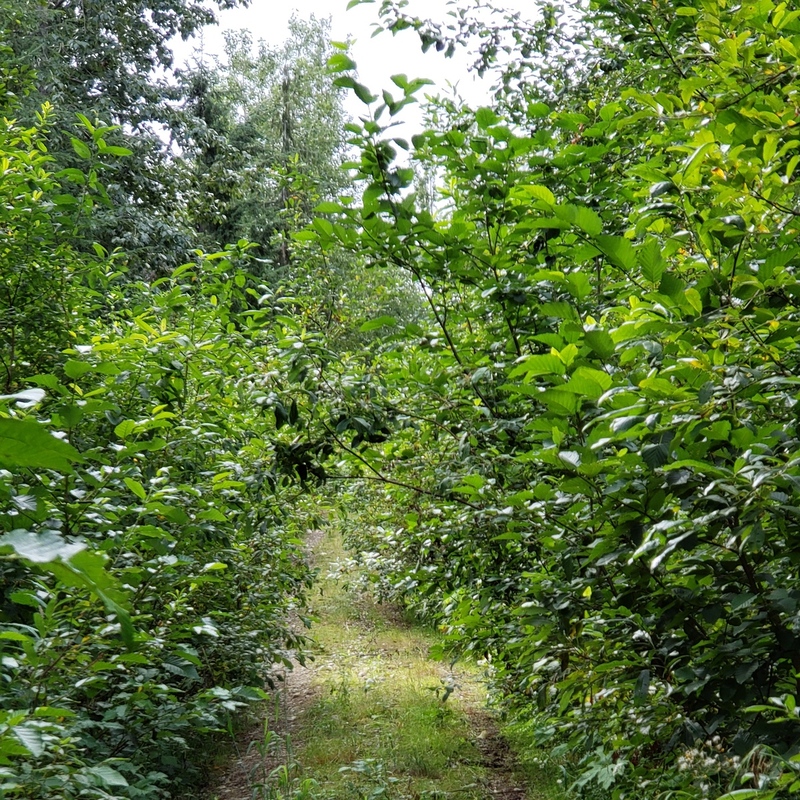 First, although my instinct is to quickly fire off a trip report about my Alaska adventure while it’s still relevant and fresh, I want my account of that trip to be more than just a trip report. As a recipient of the Kyle Dempster Solo Adventure Award, I agreed to tell my story in a meaningful way, rather than just a brief description of events and conditions. So I’m taking my time with that particular trip report, in an effort to honor my commitment and create something worth sharing with Kyle’s friends and family. 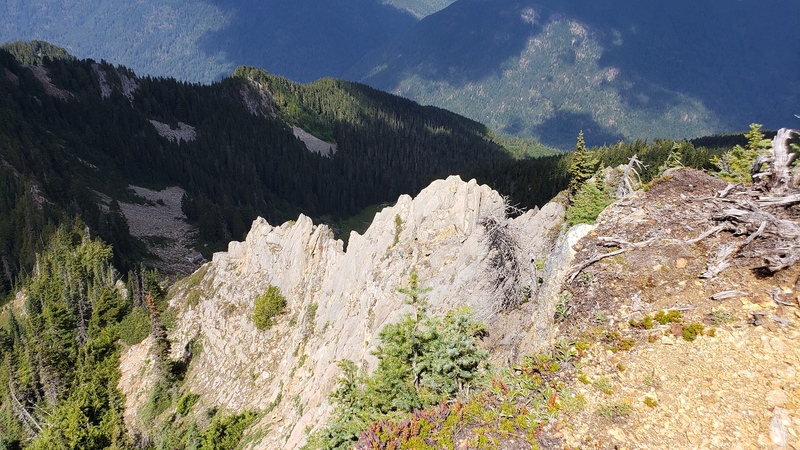 Since I returned from AK, I’ve spent time on Noble Knob, Skyline Divide, parts of the PCT, Dock Butte and Blue Lake, Bagley Lakes, and Sauk Mountain and Sauk Lake. 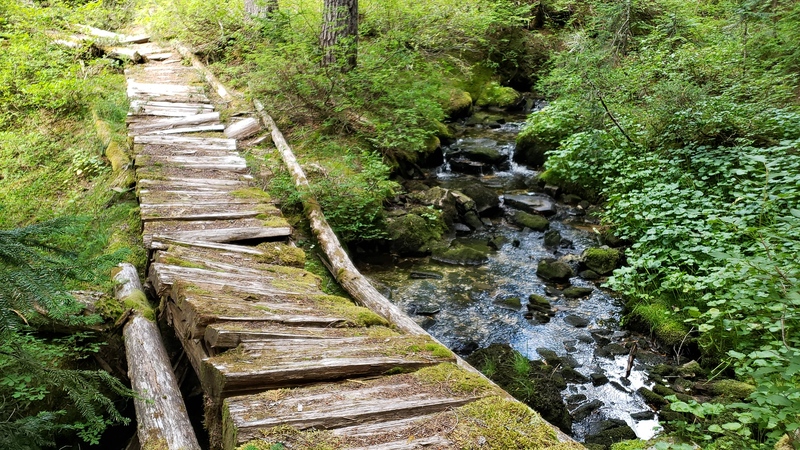 These are all great options if you’re looking for easy to moderate trails with spectacular scenery in Western Washington. Each of the links above will lead you to a detailed description of each trail/area, as well as numerous recent trip reports. I’ve also taken a few pictures, which you can find here. However, last week I finally went somewhere that I felt warranted a trip report – and what an awesome day it was! I forgot how much I love getting even a little bit off the beaten path. 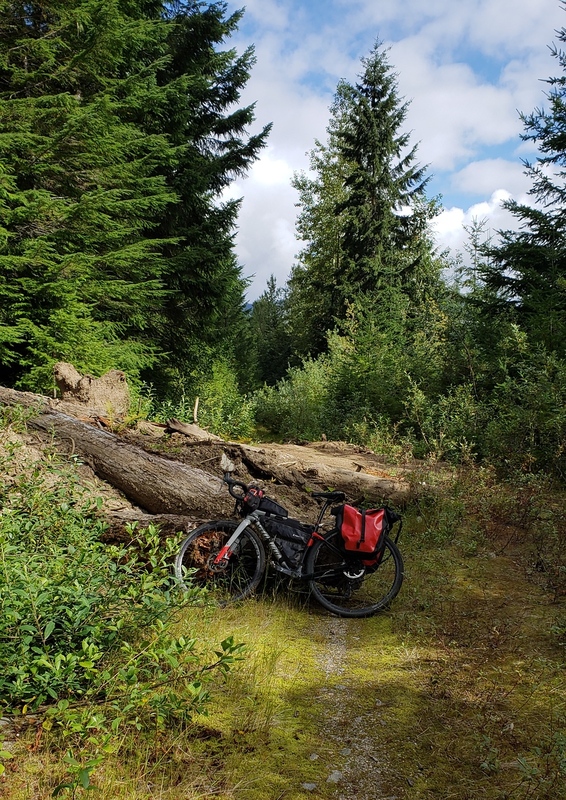 There is something undeniably special about the high country and I am so grateful I can access it relatively easily via Sauk Mountain or Skyline Divide. But the alpine is even more special (to me) when I have to work for it. And to get to Circle Peak, you definitely have to put in a little effort. Nothing insurmountable and still just a daytrip, but a bit more than just driving to the trailhead. 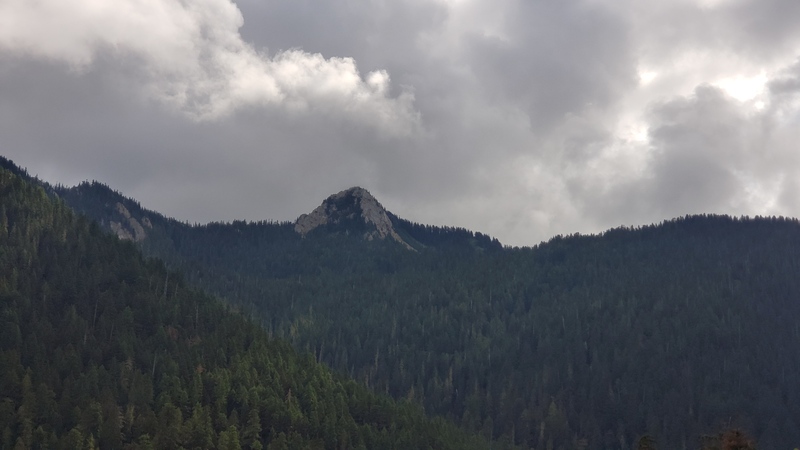 There isn’t a lot of info about accessing Circle Peak, primarily because the trail is no longer maintained by the Forest Service. 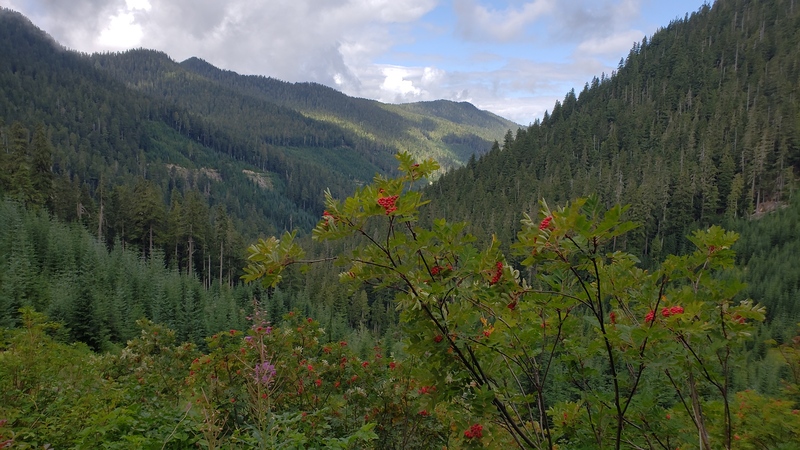 The best I could find was a SummitPost write-up, as well as this piece from Cascade Hiker. The info described in SummitPost is fairly accurate, with a few minor changes. First, the road: the SummitPost driving directions are good, with the exception of the revisions I’ve made below. Beyond the gate, the road is no longer in good condition, and it’s pretty obvious why it’s closed to traffic. The first couple miles are fine, and have actually been flagged somewhat recently – I wonder if they are planning to do repairs? But 2.5 miles from the gate there is a big wash-out. Beyond this wash-out, road conditions deteriorate further and at some points it’s so brushy that the road starts to look like single track (not that I’m complaining! :). I rode my gravel bike (a Specialized Diverge with 38s) to the trailhead with no problems, although I did hike-a-bike a couple short sections. Someone on a mountain bike could easily ride the whole thing. There were plenty of water sources along this road section, even in late summer. After almost exactly 5 miles of riding uphill on the closed-to-vehicles road, you reach the trailhead. 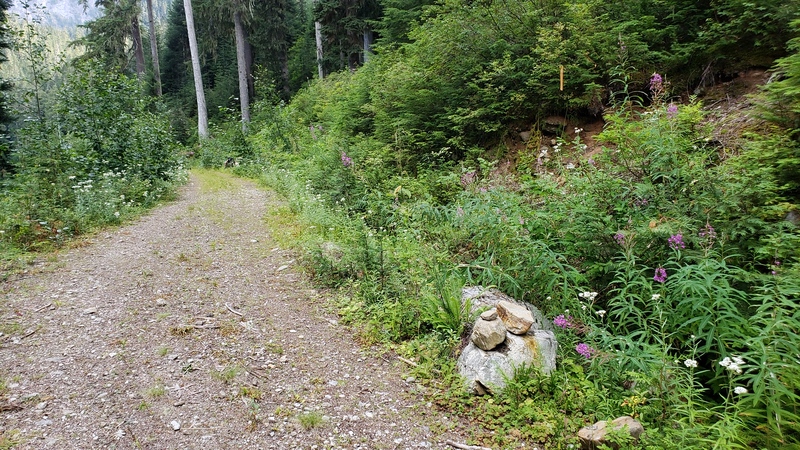 Contrary to the SummitPost write-up, you no longer have to go all the way to the end of the road, and you no longer have to bushwhack from the road up to the trail. 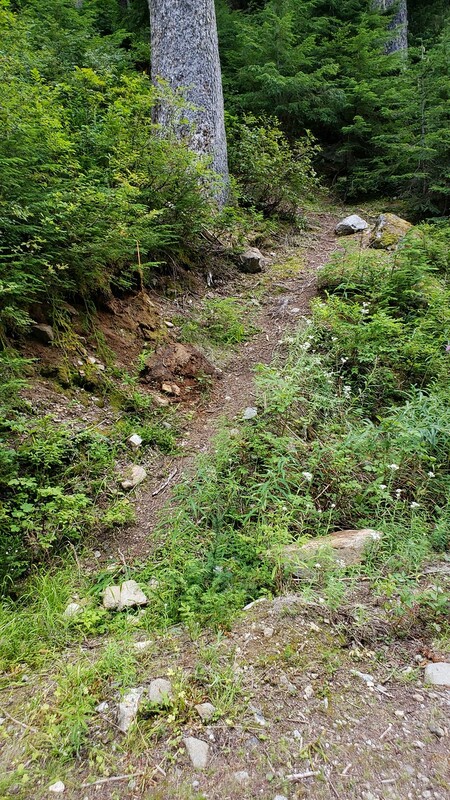 There is now a very well-worn bootpath that climbs steeply from the road to the trail. The boot path is on the right, almost exactly 5 miles from the gate, and marked by a small cairn. It is clearly visible from the road if you’re looking for it. I left my bike near the cairn and started up the bootpath. In no time you’re on the “real” trail, which is more of a bootpath itself at this point. There are a couple significant but passable blow-downs and the tread is mossy in some places and brushy in others, but it’s always there. 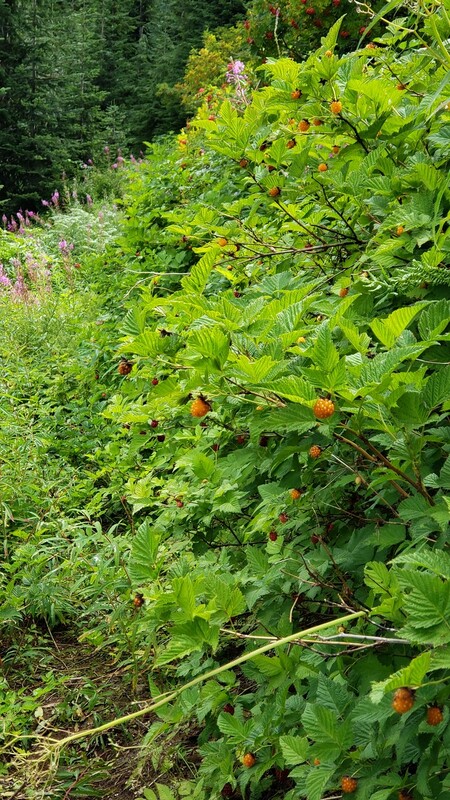 And lined with berries. SO MANY BERRIES! All untouched. 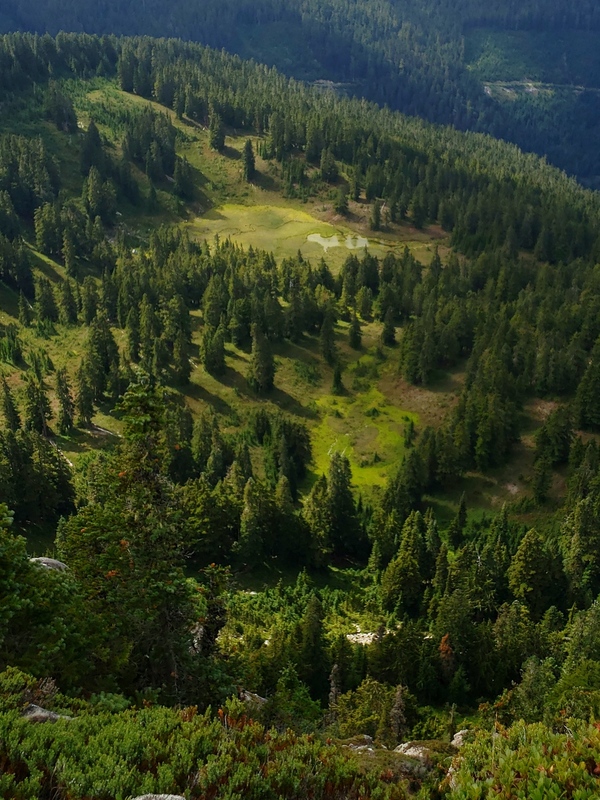 After a mile or so, you reach a beautiful green meadow with a small stream running through it, and views up to the rocky ridgeline that ultimately leads to Circle Peak. I could’ve stayed in this meadow for hours. 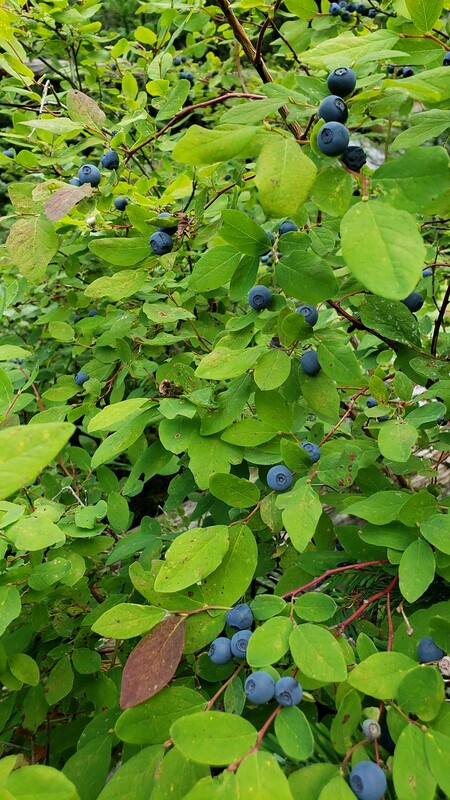 It was completely quiet, the air was perfectly warm, and the blueberries were so ripe and plentiful that they actually scented the air. 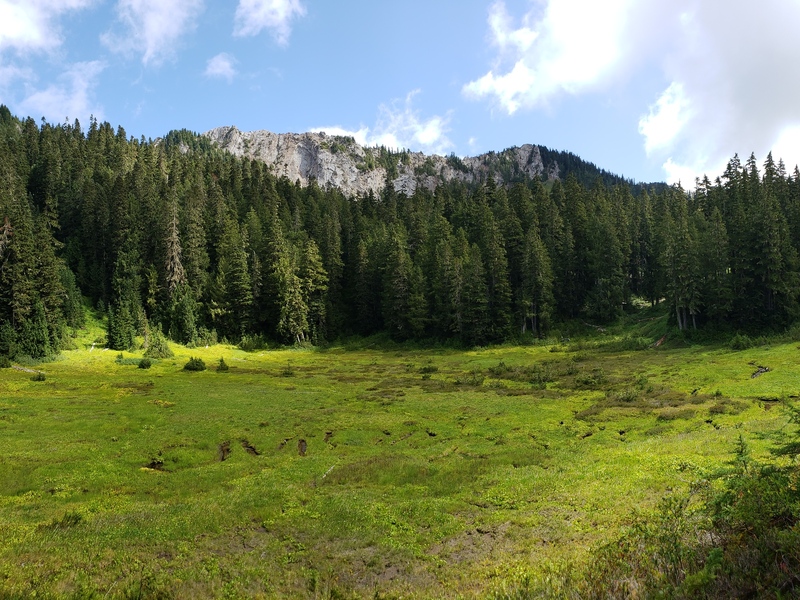 It might not look like much in the pic, but this meadow was amazing. 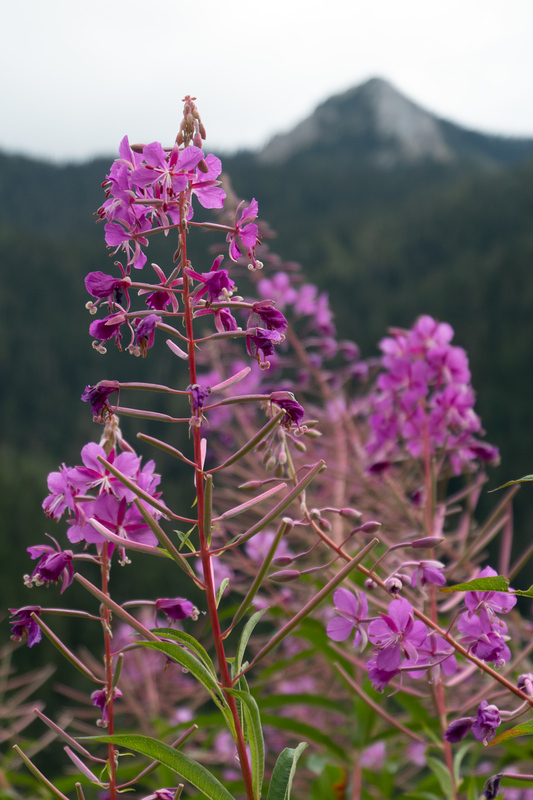 The trail continues climbing via narrow and sidesloping switchbacks through steep meadows of wildflowers. At just under 3 miles from the trailhead, you pop out on the false summit. 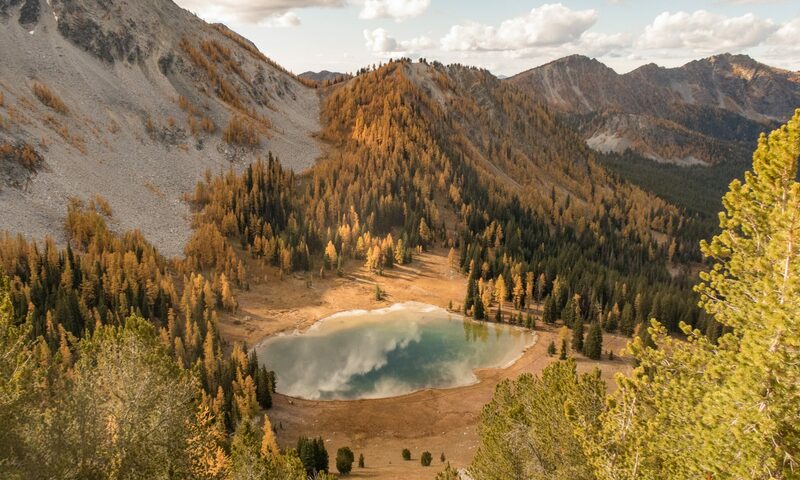 Some trip reports and guide books encourage you to stop here, warning that reaching the true summit involve a dangerous scramble. 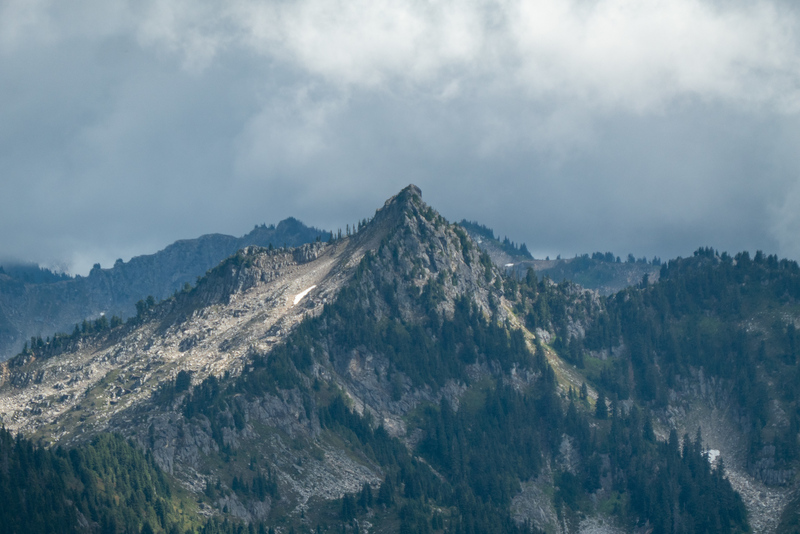 From what I experienced, the minor scrambling leading up to the false summit is no scarier than the minor scrambling leading to the true summit. 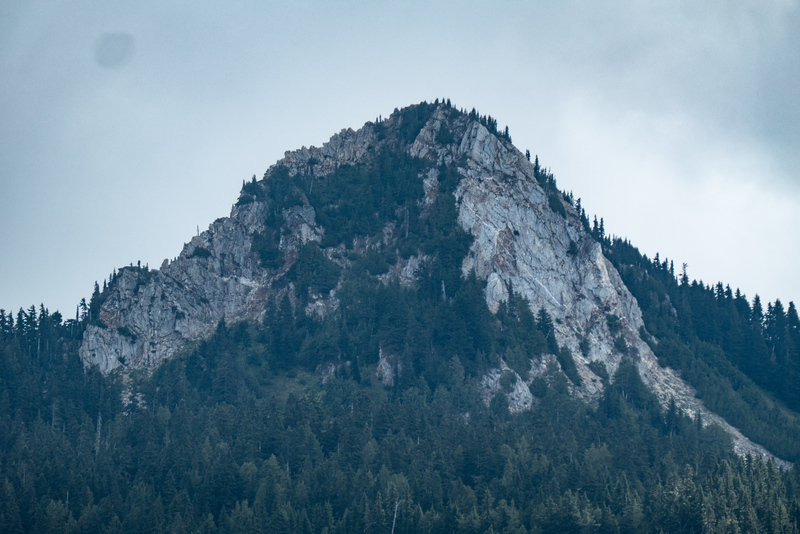 Going beyond the false summit might look intimidating, but if you head left around the rocky outcropping you will see a clear path. I had a fun time looking through the summit register, which contained entries dating back to 2001 or earlier, some signed by familiar names (Hi Alexei!) . I’ll admit I was slightly thrilled to find that I was only the third party to summit Circle Peak this year. One couple in June, another couple in July, and then me in August. 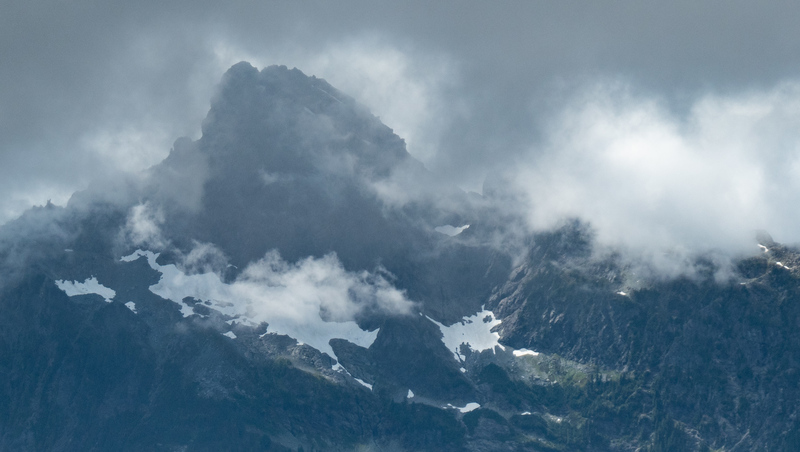 As I basked in the sun on the summit, clouds and fog rolled through, obscuring and then revealing the surrounding ridgelines. 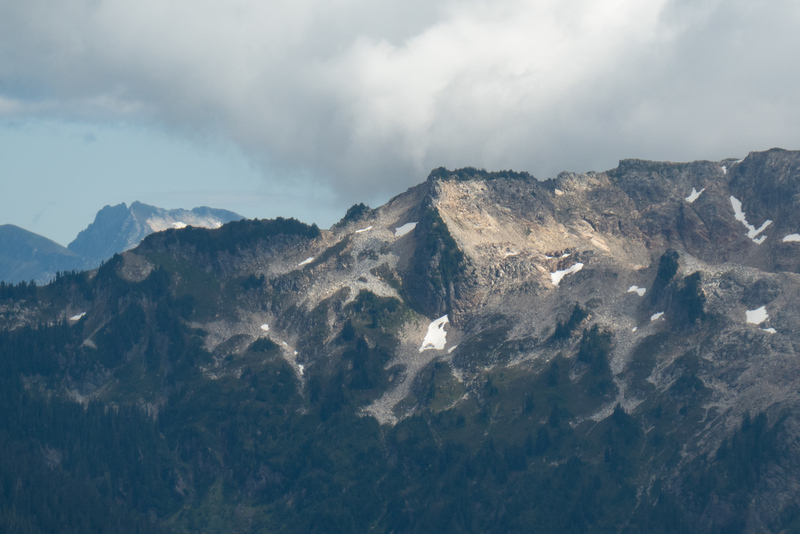 I never did get a clear view of White Chuck, Glacier, or any of the other major North Cascade peaks, but on that particular day it was enough to just know they were there.